So technically it’s still summer, but it just feels right to start adding a little plaid to my wardrobe, considering fall will be here before you know it! We are just getting into the hottest months here in CA. So while most of you will be transitioning into sweaters and jeans, I’ll still be dying of heat stroke in shorts and tank tops for another 2 months. It’s soooo NOT my favorite. Sad face. Sooo I actually NEED these sunglasses! I had my eye on them and was trying to hold back but you look so adorable in them! Love this whole look! I love how you paired the plaid scarf with denim shorts!! What a fun look! I love that plaid scarf! I’m super excited to break out a few fall pieces this week! LOVE LOVE LOVE!!!! AHHH can i just have a day in your closet!!! So gorgeous!!! Such a fabulous pre-fall look Shauna! The weather here is getting cooler, and I am sure it will be well on its way there soon. Beautiful scarf, I’m absolutely loving it! Oh geez! Another two months of this heat?! I don’t think I could do it! Love the plaid though and those booties are too cute! Happy Monday! Hooray for booties! Love how you incorporated some fall elements but this is still a warm weather appropriate outfit. LOVE that scarf!! Really gets me sad that fall (and cold weather) are just around the corner though! I’m not ready to give up summer! This scarf is the perfect transition piece! I love that it’s red and black plaid, I think i need it for football season. So cute! Love your plaid intentions for fall. You nailed the transition look – I love it. What a great way to rock that scarf in the summer! Love the plaid scarf with the denim shorts and booties! Still summery but ready for fall! that scarf is amazing!! you look great in this outfit! I’ve already started transitioning for Fall too! The clothes are just too good not to! I’m ready to wear my plaid & my scarves too! Like Cali, Texas will be warm for a little while longer. 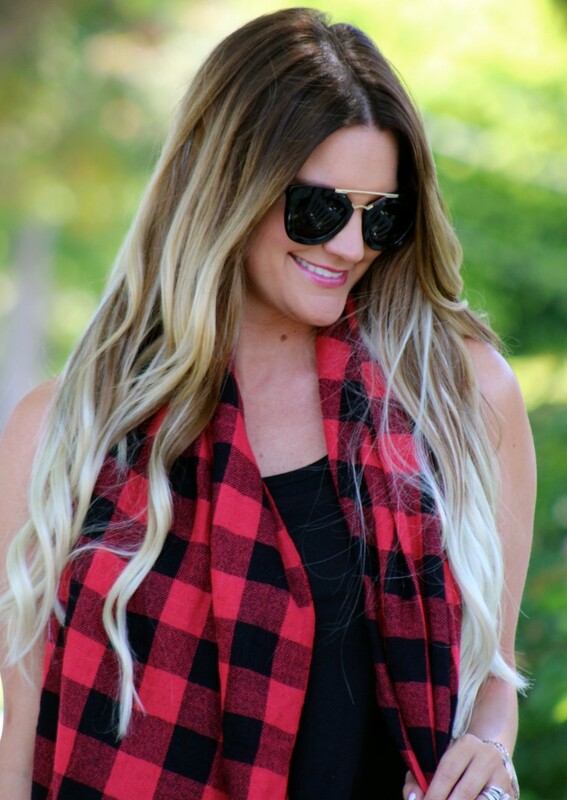 I love this plaid scarf! I can bet you will be wearing it all fall/winter long! Ahhh the plaid scarf is back! Love it with the Summer outfit! This look is super cute, love that plaid scarf!! Ahhh that scarf is perfection – the perfect transition to fall.. and for $15 I’m sold!!! 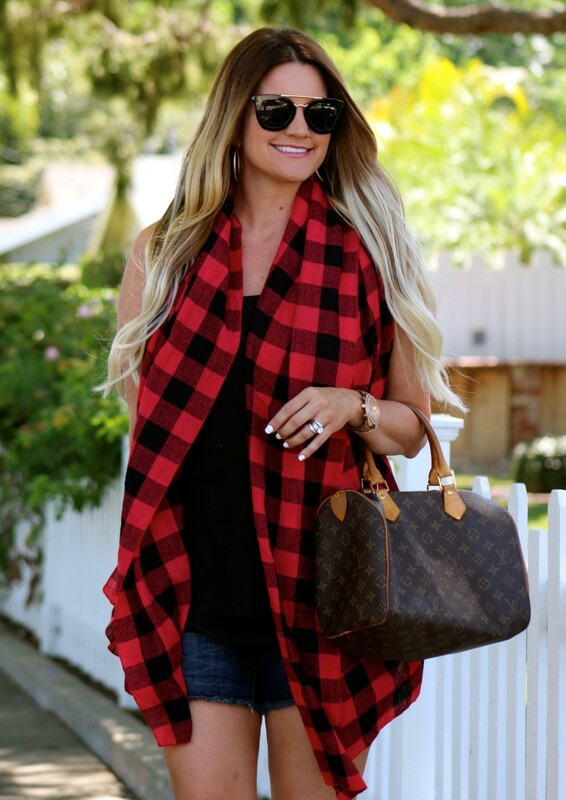 Loving this plaid scarf! Perfect for transitioning into fall. Perfect look to enjoy the rest of the summer and start to transition into fall. Great intensions. Thanks for sharing and happy Monday! You’ve nailed it perfectly! I’m so ready for fall fashion even though the weather isn’t cooperating. Wow someone’s so chic and ready for Fall! I love that you are starting to incorporate plaid and booties into your wardrobe! What a cute way to wear plaid without donning a plaid shirt and sweating to death! nice outfit. i especially love the scarf & the sunnies! I like the combination of plaid and booties. You look great. I loooove the plaid! Perfect styling! Buffalo check print? Oh my goodness, you’re making me melt. NYC is still really warm and humid. Wherever you are, enjoy the cooler temps. So jealous! Love that scarf! Plaid is my favorite thing about fall! You hair looks more and more amazing in every post! Oh my goodness, I LOVE this whole look!! You look so chic in your plaid and sunnies! I am so ready to break out the plaid! I love love love this! That plaid scarf is fabulous. I love the colors, the length, everything! Great booties too. SO CUTE! I love this time year when summer short and fall scarves go perfetly. ADORABLE! Fantastic look and scarf! Have a fun week! Really cute scarf and booties, love the look. Dear you are a diva!!! 🙂 love your boots! Amazing photos, I love your style! perfect styling.. plaid so so perfect on you..
great blog, I love the content! I adore this look! Such a great Fall transition outfit. This red buffalo plaid is my favorite plaid pattern!! You look adorable with your cut-offs and wedge booties. Thanks for linking up with our Tuesday Fashion Party Link-Up! I live in SoCal too and I’m sad that fall won’t be here for awhile! But this is a great transition outfit with the plaid scarf and booties! Oh, girl, I hear ya. It’ll be another two to three months before we start feeling “fall” over here as well. The red and black plaid really suit you well. You look beautiful! I’m so ready for fall, scarves and layers, too! You did a great job of incorporating a scarf into your summer-wear. Thanks for linking-up for Lovely Little à la Mode! Thank you so much for linking up with me last week and don’t forget to come back every Wednesday to link up with me again!